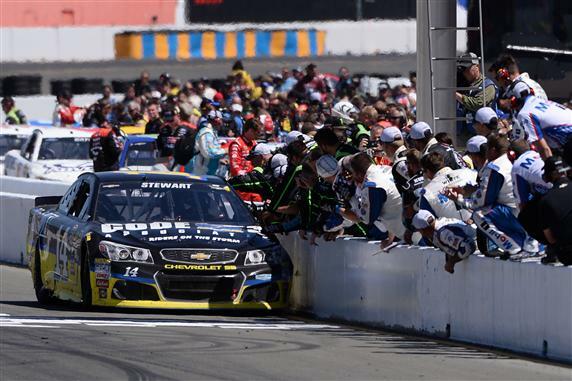 SONOMA, Calif. – Is Tony Stewart having fun yet? In his last year of NASCAR Sprint Cup Series racing, Stewart came to Sonoma Racing asserting on Friday he wasn’t having much fun driving a Sprint Cup car. That all changed in Sunday’s Toyota/Save Mart 350 at the 1.99-mile road course, where Stewart bulldozed Denny Hamlin into the outside wall in Turn 11, executing a dramatic last-lap pass for his first victory since June 2, 2013 at Dover. In the three years since that victory, a succession of injuries and a personal tragedy have limited the three-time champion’s time in a Sprint Cup car and limited Stewart’s effectiveness when he was behind the wheel of the No. 14 Chevrolet he co-owns with Gene Haas. But on Sunday, after a prescient pit call by crew chief Mike Bugarewicz put Stewart in the lead for a restart on Lap 91 of 110. Stewart held the top spot at the start/finish line for the rest of the race, but that hardly describes the excitement of the final lap. For the second straight circuit, Stewart wheel-hopped the No. 14 Chevrolet into Turn 7, and Hamlin took full advantage, giving Stewart a bump and charging past him. In hot pursuit through the esses and Turn 10, Stewart caught Hamlin in the hairpin (Turn 11) when Hamlin slipped and ran wide. Contact from Stewart’s car sent Hamlin’s No. 11 Toyota fish-tailing into the outside wall, but Hamlin held the runner-up spot, crossing the stripe .625 seconds behind the race winner. “I take that, but I’m probably going to get the (crap) beat out of me,” Stewart said on his radio, after notching his third victory at Sonoma, his eighth on a road course and the 49th of his career. In other words, Stewart is all but a lock to compete for a fourth title in NASCAR’s 10-race playoff. Third-place finisher Joey Logano was trailing the action into the final corner, hoping Hamlin and Stewart would take each other out. “Going into Turn 11, I was 100-percent sure that Denny was not going to win just by watching it, and we were right there on the cusp of trying to sneak one by,” Logano said. Having opened up the inside lane in Turn 11, Hamlin shared Logano’s sense of inevitability. Had Stewart and Bugarewicz not chosen the perfect time to make a pit stop, however, Stewart almost certainly would not have won the race. With NASCAR officials scanning the track after reports of debris between Turns 6 and 7, Stewart and his crew chief decided to gamble and bring the car to the pits on Lap 86. NASCAR called the caution a lap later, and when all the rest of the contending cars pitted under yellow on Lap 88, Stewart inherited a lead he would hold—with the exception of Hamlin’s brief interlude from Turns 7 to 11—for the rest of the race. “It was just a chance that we took, a chance to get a win,” Bugarewicz said. Polesitter Carl Edwards finished fourth, followed by Martin Truex Jr., Kevin Harvick and Kyle Busch. Ryan Newman, Kasey Kahne and Kurt Busch completed the top 10. Harvick retained the series lead by 35 points over second-place Kurt Busch.